Commemoration of the Avro Anson Aircraft Crash in Assynt. The drive up to the North West was as usual magical’ leaving Inverness it is another world and though the hills were shrouded in mist old favourites passed by and I had a stop near the Fannich. The hills are so green but there are now so many wind farms about – progress. I was soon in Ullapool and my tea at the chippy and then to me the best part of the journey from Ullapool, the summer Isles with some sun and the great peaks of Assynt shrouded in mist but still wonderful. 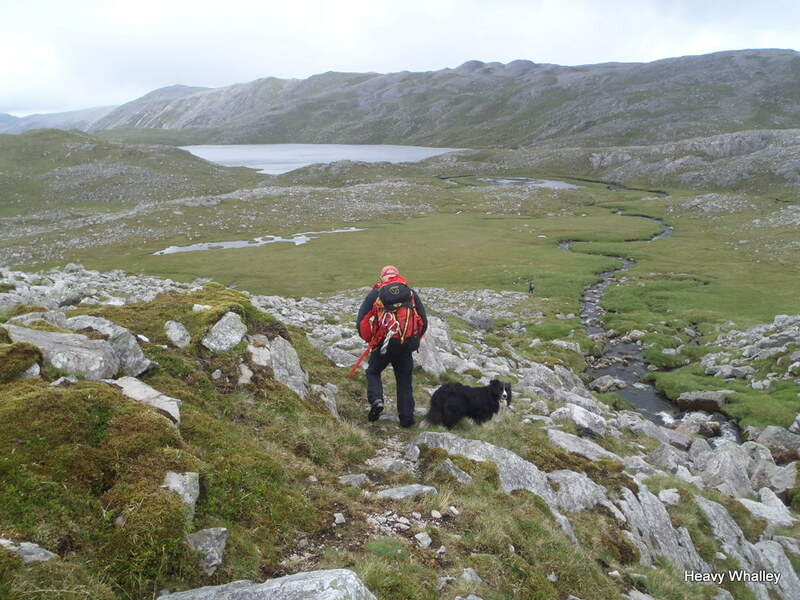 I was staying just below Suiliven at the Scottish Mountaineering Clube Hut for the night at Elphin the Naismith hut. The hut was very busy, the Gritstone Club and in great from up for a week and having some great days walking, climbing and caving. The were some real characters there and they looked after me, we had some good chats. There were not the usual view from the hut as Suliven dominates and I have sat I slept on the floor in the front room. The midges were out as I went for my sleeping kit in my shorts and I got really bitten! The hut was warm and no windows could be opened due to the midgy threat and the snores from upstairs made it a noisy night. The weather clears as we make our way to aroeplane flats where the Anson Crashed. 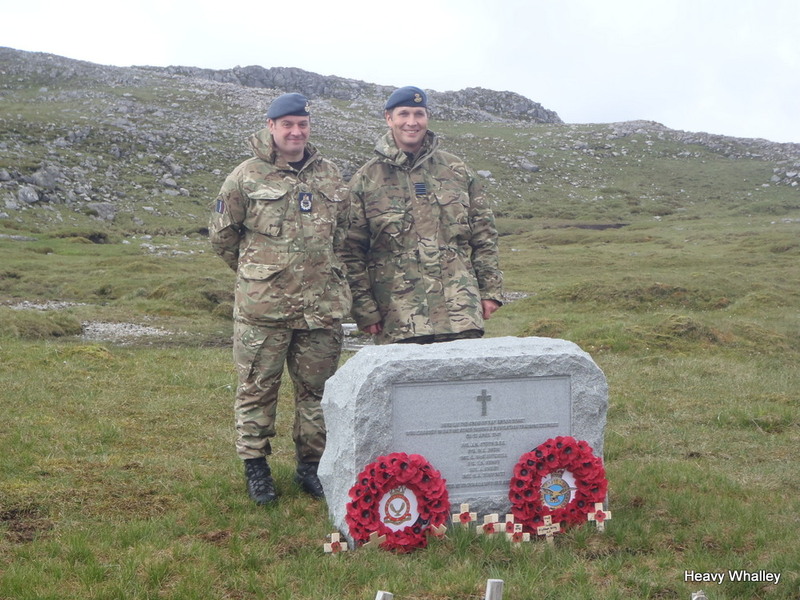 Almost seventy-five years after they died, an RAF crew has been remembered in a moving ceremony at one of the remotest war grave sites in the Scottish Highlands. Pilot Officer William Drew, Sergeant Jack Emery, Sergeant Harold Arthur Tompsett, Flying Officer James Henry Steyn (DFC), Sergeant Charles McPherson Mitchell and Flight Sergeant Thomas Brendon Kenny were killed when their Anson plane crashed on Ben More Assynt in April 1941. 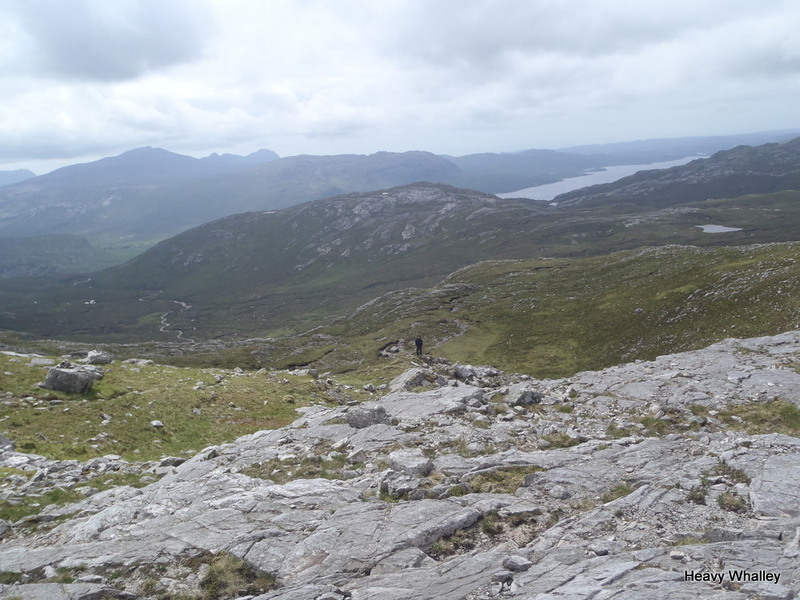 The dedication of the Memorail, the weather cleared and the Church of Assynt was in full view. Due to the inaccessibility of the crash site, the crew were buried on the mountain – their final resting places marked with a cairn. The crew were commemorated by the Commonwealth War Graves Commission (CWGC) on a memorial in the nearest graveyard at Inchnadamph Old Churchyard, 20 miles north of Ullapool. In 2012, the CWGC decided to replace the existing cairn, which had deteriorated on account of the harsh climate, with a granite marker weighing some 600 kilograms, to identify and protect the aircrew’s burial site from becoming lost or disturbed in the future. 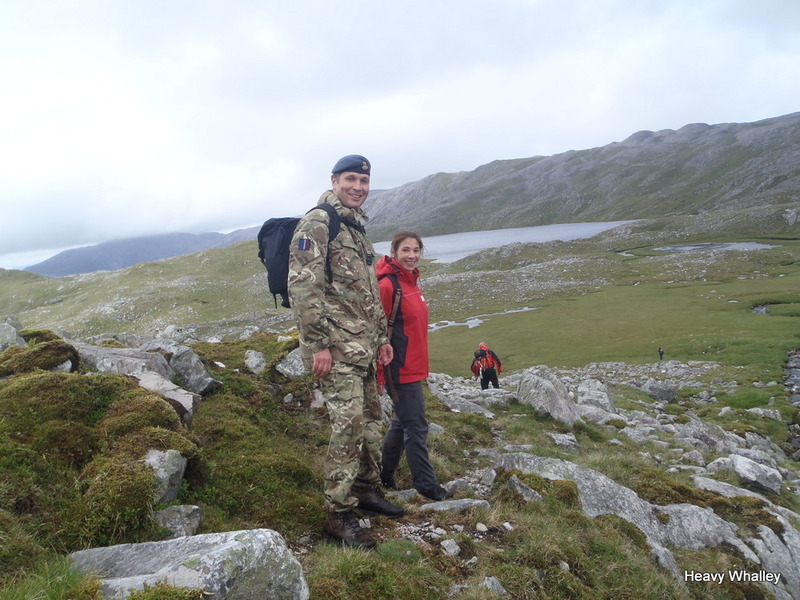 The work was completed in the summer of 2013 with the assistance of a number of partners, including the Royal Air Force, who assisted with the use of a Chinook helicopter to airlift the new marker, tools and materials onto the mountain. Great support from the War Graves Commision,RAF, ATC, Assynt MRT, & many other Agencies. Relatives of the men joined representatives from the CWGC, RAF Lossiemouth, Assynt and Dundonnel Mountain Rescue Teams, and Air Cadets for a dedication ceremony at the grave site at 14.00 hours on 12 June. Squadron Leader Alastair Armitstead RAFVR, who organised the dedication ceremony said: “I know how pleased some of the relatives are that the CWGC has managed to get a formal memorial on the site and that they will look after it for evermore. It is rewarding and reassuring that almost 75 years after these men died, there is a fitting tribute at their grave. End of a long journey 12 trips over 3000 miles and the Memorail is complete and dedicated. My old Eric Hughes would be very proud. The weather held and it was a short moving service, thanks to all. The Commission maintains the graves and memorials of the 1.7 million Commonwealth servicemen and women who died during the two world wars. It also holds and updates an extensive and accessible records archive. The Commission operates in over 23,000 locations in 153 countries across all continents except for Antarctica. 14-18: A series of high-profile worldwide events will take place to mark the centenary of the First World War, many of which will take place at Commission sites. The Commission will ensure that these sites are maintained at the highest standard and is installing information panels at over 500 sites to enhance the visitor experience. Smartphone users will also be able to access additional information, including the personal stories of some of those buried at the site. The Commission provides teachers and youth workers with a comprehensive range of educational resources and support materials so that future generations remain engaged in the work of the Commission and continue to remember those who died in the two world wars. Big thanks to all for there help – job done. This entry was posted in Aircraft incidents, Articles, Enviroment, Friends, Mountain rescue, Views Mountaineering, Weather, Wildlife. Bookmark the permalink. 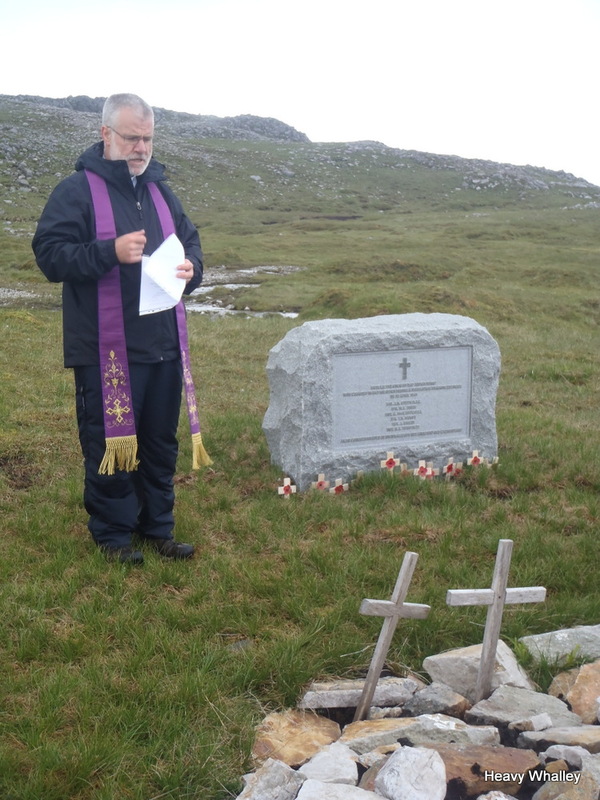 11 Responses to Commemoration of the Avro Anson Aircraft Crash in Assynt. Heavy your old boss and friend Eric would be proud of you for instigating and seeing this project through to the end. I don’t know how you did it but once again the weather was kind to us. I noticed that the CWGC media release got the weights wrong again, initially it was going to be a 600kg marker but ended up as a 800kg steel reinforced concrete base with an 1100kg granite stone. It was important to get the weights correct for the helicopter lift. If it was only 600kg then we could have done it by sea king and not chinook. RAF Odiham was also represented at the service. Having spent 18 years at Kinloss, this whole project was fantastic to be involved in. I can honestly say that it was my most rewarding task in my 31 years in the RAF. For me the dedication service with so many relatives in attendance was the perfect way for this tragic crew to be remembered. You and Iain from the CGWC should be very proud of what you have achieved, well done mate. Steve it was a great day and good to see you again – It was amazing how it all fell together. Great to see so many people working towards the same goal. Hi there – sorry to ask such a daft question, but – when you say “a walk that took 3 hours” do you mean 3 up and then 3 down or a total round trip of 3 hours. We’re planning a trip to Assynt this October, would like to visit the memorial but obviously need to plan properly. Paul a fit party will take between 2 hrs – 3 hrs on way up a add time for visit and about 2 hrs down – total 6 hrs just a guide all depends on weather – fitness navigation visibility – hope this helps ! It is a magical place! NC 2939223139 AT 643 METRES. Have a great day can you send me a photo – it will be interesting to see how the Memorial has settled? A visit to the Church at Inchnadampth is worth while! Will see what we can do – weather permitting!! Thanks have a safe trip.